﻿ Environmental Sustainability, Does It Make Dollars and Sense? There is great opportunity for businesses. Raising more people into the global middle class, by providing education, health services, and green infrastructure, will mean tremendous market growth, said Kevin Moss, global director of the World Resources Institute’s Business Center. Sustainable business models could create $12 trillion in revenue and savings and add 380 million jobs by 2030, he said. But taking advantage of this potential while reducing humanity’s already significant impact on the planet is the central tension of global development. GDP and population growth may lead to a “tripling of natural resources that we extract from the planet,” said Moss. And humans are already using most, if not all, of the available water, agricultural land, and ability to absorb both physical waste and excess greenhouse gas emissions. To navigate this, businesses must learn to take the long-term view on natural resource extraction, look to new models of growth besides volume, and tap into the desire of workers to not only make a profit but have an impact on social and environmental problems, said panelists. There is, at the very least, growing awareness of this challenge in the business world. In a global survey of 1,000 CEOs, 97 percent said that sustainability is important to the future success of their business, said Jennifer Bogart, a strategy manager at the consulting firm Accenture. But many corporations have trouble quantifying the value of sustainability, Bogart said. The nature of quarterly reports makes it difficult to emphasize long-term growth over the short term, and there is little alignment within the investment community about the value of such business models, she said. Sustainable business models therefore differ greatly by company, sector, and region. One of the core principles that the World Resources Institute focuses on is shifting away from the idea that businesses can only achieve growth by selling more things to more people, said Moss. It’s a “taboo topic” and difficult to bring up for many companies, he said, but we need to break the link between volume and profit so that businesses can think about growth in new and innovative ways. He pointed to Rent the Runway as an example of a company that has created a new business model by renting expensive clothing to people over and over instead of creating and selling more clothes to more people. Gap, Inc., has similarly focused on reducing waste, said Government Affairs Specialist Gabrielle Friedman, as it strives to be “more than a company that sells clothes.” Gap has a variety of sustainability goals it hopes to achieve by 2020, she said, including reducing greenhouse gas emissions by 50 percent, further improving recycling and sourcing, and marketing these improvements directly to consumers so they can add value. In fact, public perception can be an important driver of sustainability, said Bogart. “Everything you do is now seen by everyone, no matter whether you want it to be or not.” Corporate social responsibility is changing with this increase in transparency, and public opinion about a company can shift very quickly when a business makes an error or does something positive. Gap, Inc., feels an “obligation to make an impact in this space” because of its wide reach, said Friedman – it sells products in 90 countries and employs 150,000 people worldwide across the supply chain. Part of its sustainable development initiatives are programs designed to help women that are part of the manufacturing process in places like India, Indonesia, and Vietnam. Programs such as PACE and Women+Water, a partnership with the U.S. Agency for International Development, aim to empower women working for the company with new skills to enhance their careers and livelihoods. They also focus on improving water sources and sanitation in communities where access to clean water is scarce and women often spend hours collecting it. Friedman said Gap wants to be involved in this development space because it affects its core business, as well as its employees. The company cannot make clothes without natural resources, and employees need clean and safe water to live and work. Resilience to the physical effects of climate change is another aspect of sustainability that businesses must stay attuned to, said Steven Wilson, a senior project manager at the Inter-American Development Bank. Wilson works on the PROADAPT program, which helps smaller firms in Latin America and the Caribbean adjust to disasters like flooding, sea-level rise, and drought. Though it could be more effective with public incentives, “[climate] resilience on the private side is actually already a market,” said Wilson. Products and services like energy-efficient technology, renewable energy, insurance, and long-term financing for big infrastructure projects are being sold worldwide at prices that reflect an understanding that the climate is changing, even if the reasons are not always explicit. Wilson said private firms do not often use climate terminology to explain these costs and calculations, instead saying they are simply responding to flooding, heat, humidity, or extreme weather. The framing is ultimately important, said Moss, because systematic change to the prevailing business model of selling the highest quantity of product to the most people will be needed. Even governments will sometimes push for consumers to go shopping when the economy is bad, he pointed out. Many companies are “predicated on that model of volume,” but many also stand to lose if they can’t develop sustainable practices. There needs to be a long-term transformation of business models in order to produce growth while saving the planet, Moss said. “Business does have the ability to innovate around these problems,” and there are real benefits to improving efficiency, like cost reductions. The digital revolution is also creating new opportunities for growth that are not reliant on physical goods, said Bogart. “It absolutely makes dollars and sense, but we’re not quite there yet,” said Bogart. 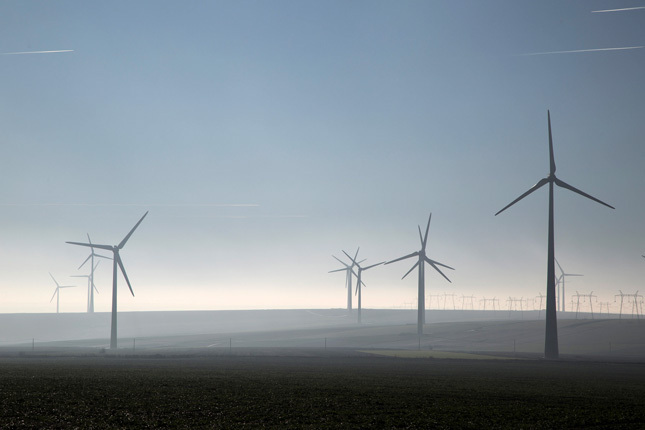 Photo Credit: Wind turbines in Romania, February 2017, courtesy of Jutta Benzenberg/World Bank.